In recent years, AI (artificial intelligence) researchers have finally cracked problems that they’ve worked on for decades, from Go to human-level speech recognition. A key piece was the ability to gather and learn on mountains of data, which pulled error rates past the success line. In short, big data has transformed AI, to an almost unreasonable level. Blockchain technology could transform AI too, in its own particular ways. Some applications of blockchains to AI are mundane, like audit trails on AI models. Some appear almost unreasonable, like AI that can own itself — AI DAOs. All of them are opportunities. This article will explore these applications. Before we discuss applications, let’s first review what’s different about blockchains compared to traditional big-data distributed databases like MongoDB. We can think of blockchains as “blue ocean”databases: they escape the “bloody red ocean” of sharks competing in an existing market, opting instead to be in a blue ocean of uncontested market space. Famous blue ocean examples are Wii for video game consoles (compromise raw performance, but have new mode of interaction), or Yellow Tail for wines (ignore the pretentious specs for wine lovers; make wine more accessible to beer lovers). By traditional database standards, traditional blockchains like Bitcoin are terrible: low throughput, low capacity, high latency, poor query support, and so on. But in blue-ocean thinking, that’s ok, because blockchains introduced three new characteristics: centralized / shared control, immutable / audit trails, and native assets / exchanges. People inspired by Bitcoin were happy to overlook the traditional database-centric shortcomings, because these new benefits had potential to impact industries and society at large in wholly new ways. These three new “blockchain” database characteristics are also potentially interesting for AI applications. But most real-world AI works on large volumes of data, such as training on large datasets or high-throughput stream processing. So for applications of blockchain to AI, you need blockchain technology with big-data scalability and querying. Emerging technologies like BigchainDB, and its public network IPDB do exactly that. 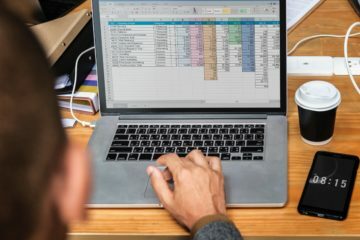 You no longer need to compromise on the the benefits of traditional big-data databases in order to have the benefits of blockchains. Having blockchain tech that scales unlocks its potential for AI applications. 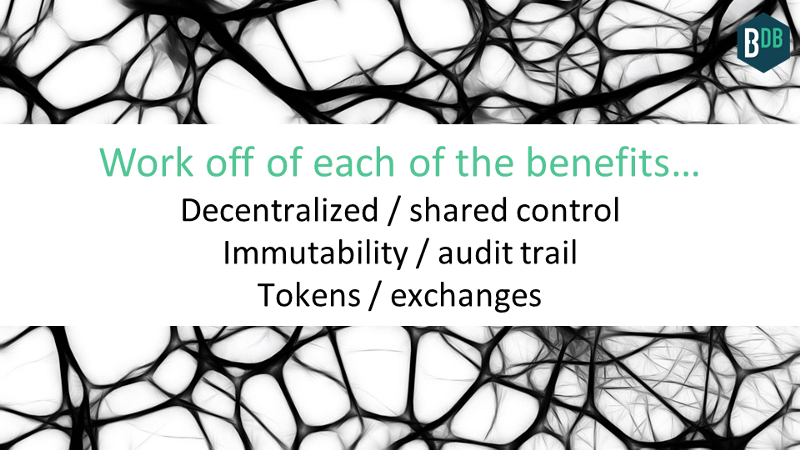 Let’s now explore what those might be, by starting with the three blockchain benefits. (1) Leads to more data, and therefore better models. (2) Leads to qualitatively new data, and therefore qualitatively new models. (3) Allows for shared control of AI training data & models. 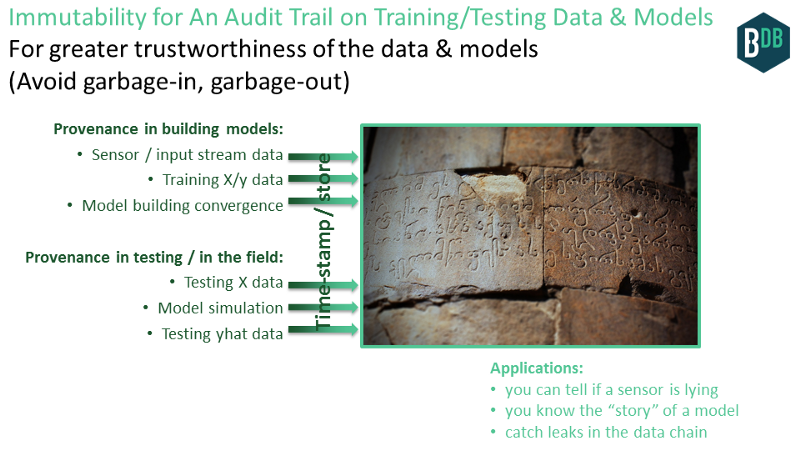 (4) Leads to provenance on training/testing data & models, to improve the trustworthiness of the data & models. Data wants reputation too. 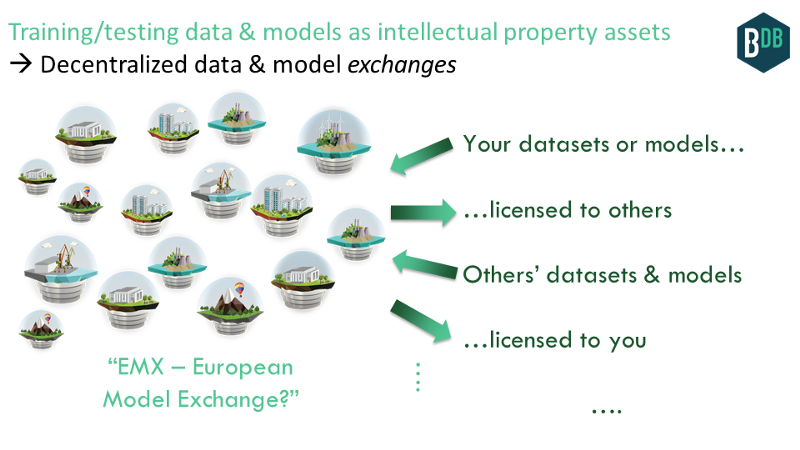 (5) Leads to training/testing data & models as intellectual property (IP) assets, which leads to decentralized data & model exchanges. It also gives better control for upstream usage of your data. There’s one more opportunity: (6) AI with blockchains unlock the possibility for AI DAOs (Decentralized Autonomous Organizations). These are AIs that can accumulate wealth, that you can’t shut off. They’re Software-as-a-Service on steroids. Many of these opportunities are about AI’s special relationship with data. So let’s first explore that. Following this, we’ll explore the applications of blockchains for AI in more detail. Here’s your fixed dataset (typically small). Design an algorithm to improve performance, for example design a new kernel for a support vector machine classifier that reduces area-under-curve (AUC). Publish that algorithm in a conference or journal. Ten percent relative improvement is about the “minimum publishable unit”, as long as your algorithm itself was fancy enough. If you got a 2x-10x, you’re looking at best-paper territory, especially if the algorithm was really fancy. If this sounds academic, that’s because it was. Most AI work was still in academia, though there were real-world applications too. In my experience, it was like this in many sub-fields of AI, including neural networks, fuzzy systems (remember those? ), evolutionary computation, and even slightly less AI-ish techniques like nonlinear programming or convex optimization. In my first published paper (1997), I proudly showed how my freshly-invented algorithm had the best results compared to state-of-the-art neural networks, genetic programming, and more — on a small fixed dataset. Oops. But, the world shifted. In 2001, Microsoft researchers Banko and Brill released a paper with remarkable results. First, they described how most work in their domain of natural language processing was on less than a million words — small datasets. Error rates were 25% for the old / boring / least fancy algorithms like Naive Bayes and Perceptrons, whereas fancy newer memory-based algorithms achieved 19% error. That’s the four datapoints on the far left of the plot below. So far, no surprises. But then Banko and Brill showed something remarkable: as you added more data — not just a bit more data but orders of magnitude more data — and kept the algorithms the same, then the error rates kept going down, by a lot. By the time the datasets were three orders of magnitude larger, error was less than 5%. In many domains, there’s a world of difference between 18% and 5%, because only the latter is good enough for real-world application. Moreover, the best-performing algorithms were the simplest; and the worst algorithm was the fanciest. Boring old perceptrons from the 1950s were beating state-of-the-art techniques. Banko and Brill weren’t alone. For example, in 2007, Google researchers Halevy, Norvig and Pereira of Google published a paper showing how data could be “unreasonably effective” across many AI domains. This hit the AI field like an atom bomb. The race was on to gather way more data. It takes significant effort to get mountains of good data. If you have the resources, you can get data. Sometimes you can even lock up data. In this new world, data is a moat, and AI algorithms a commodity. For these reasons, “more data” is a key imperative for Google, Facebook, and many others. Once you understand these dynamics, specific actions have simple explanations. Google doesn’t buy satellite imaging companies simply because it likes space; and Google gives away TensorFlow. Deep learning directly fits in this context: it’s the result of figuring out how, if given a massive enough dataset, to start to capture interactions and latent variables. 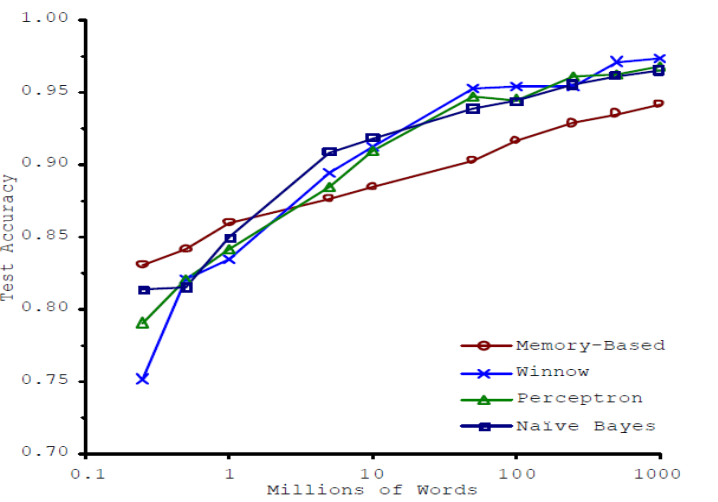 Interestingly, backprop neural networks from the ’80s are sometimes competitive with the latest techniques, if given the same massive datasets. See here. It’s the data, silly. My own coming-of-age as an AI researcher was similar. As I was attacking real-world problems, I learned how to swallow my pride, abandon the “cool” algorithms, build only as much was needed to solve the problem at hand, and learned to love the data and the scale. It happened in my first company, ADA(1998–2004), as we pivoted from automated creative design to “boring” parameter optimization; which incidentally became less boring in a hurry as our users asked us to go from 10 variables to 1000. It happened in my second company, Solido (2004-present), as well, as we pivoted from fancier modeling approaches to super-simple but radically scalable ML algorithms like FFX; and once again was un-boring as our users pulled us from 100 variables to 100,000, and from 100 million Monte Carlo samples to 10 trillion (effective samples). Even BigchainDB, the product of my third and current company, emerged from the need for scale (2013-present). Zoom in on features, zoom up on scale. In short: decentralized / shared control encourages data sharing, which in turns lead to better models, which in turns leads to higher profit / lower cost / etc. Let’s elaborate. AI loves data. The more data, the better the models. Yet data is often siloed, especially in this new world where data can be a moat. But blockchains encourage data sharing among traditional silos, if there is enough up-front benefit. The decentralized nature of blockchains encourages data sharing: it’s less friction to share if no single entity controls the infrastructure where the data is being stored. I give more benefits later on. Within-enterprise: data from different regional offices is merged using a blockchain technology, because it lowers the cost for the enterprise to audit their own data, and to share that data with auditors. With that new data in place, the enterprise can build AI models that, for example, predict customer churn better than their previous models which were only built at the level of regional office. A “data mart” for each regional office? Within-ecosystem: competitors (say, banks or music labels) traditionally would never share their data. But it would be straightforward to show how, with combined data from several banks, one could make better models for, credit card fraud prevention. 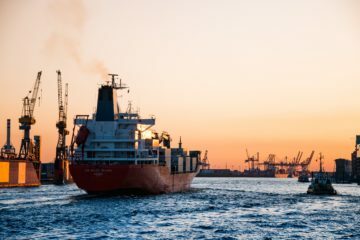 Or for organizations along a supply chain, that share data via a blockchain, one could better identify root causes of failures later in the supply chain, using AI on data from earlier in the supply chain. For example, where exactly did that strain of E. coli emerge? Within-planet (public blockchain database): Consider the sharing of data among different ecosystems (e.g. energy usage data + auto parts supply chain data); or of individual participants in a planet-scale ecosystem (e.g. the Web). More data from more sources could improve the models. For example, spikes in energy usage in some factories in China might be correlated with fraudulent auto parts emerging on the market a day’s worth of shipping later. Overall, we’re seeing signs of this with companies that aggregate data, sanitize it, and repackage and sell it; from good old Bloomberg terminals to the dozens (or hundreds) of startups selling data through http APIs. I explore this further in a later point. Enemies sharing their data to feed an AI. 2016 is fun! In some cases, when data from silos is merged, you don’t just get a better dataset, you get a qualitatively new dataset. Which leads to a qualitatively new model, from which you can glean new insights and have new business applications. That is, you can that do something you couldn’t do before. Here’s an example, for identifying diamond fraud. If you’re a bank providing diamond insurance, you’d like to create a classifier that identifies whether a diamond is fraudulent. There are four trusted diamond certification labs on the planet (depending who you ask, of course:). 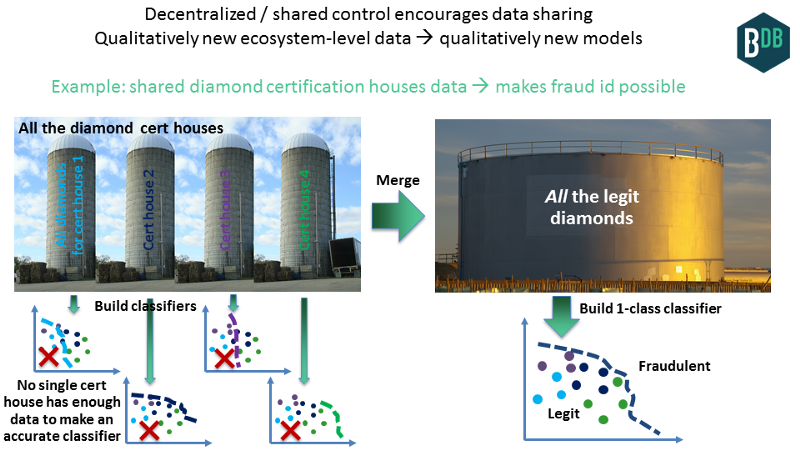 If you only have access to the diamond data for one of these labs, then you’re blind about the other three houses, and your classifier could easily flag one of those other houses’ diamonds as fraud (see picture below, left). Your false positive rate would make your system unusable. Consider instead if blockchains catalyze all four certification labs to share their data. You’d have all the legitimate data, from which you would build a classifier (below, right). Any incoming diamond, for example seen on eBay, would be run through the system and be compared to this all-data one-class classifier. 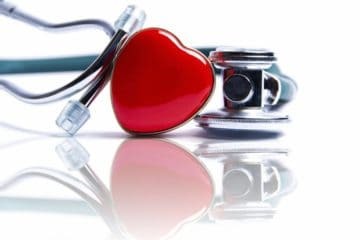 The classifier can detect legitimate fraud and avoid false positives, therefore lowering the fraud rate, to benefit of insurance providers and certification labs. This could be simply framed as a lookup, i.e. not needing AI. But using AI improves it further, for example by predicting price based on color, carats, etc. then using “how close is price to expected value” as an input to the main fraud classifier. Here’s a second example. An appropriate token-incentive scheme in a decentralized system could incentivize datasets to get labeled that could not be previously labeled, or labeled in a cost-effective fashion. This would be basically a decentralized Mechanical Turk. With new labels we get new datasets; we train on the new datasets to get new models. Hoard vs. share? There’s a tension between two opposite motivations here. One is to hoard data — the “data is the new moat” perspective; the other is to share data, for better/new models. To share, there must be a sufficient driver that outweighs the “moat” benefit. The technology driver is better models or new models, but this driver must lead to business benefit. Possible benefits include reduced fraud for insurance savings in diamonds or supply chains; making money on the side in Mechanical Turk; data/model exchanges; or collective action against a powerful central player, like the music labels working together against Apple iTunes. There are more; it requires creative business design..
As discussed, data & model sharing can happen at three levels: within an enterprise (which for multinationals is harder than you might think); within an ecosystem or consortium; or within the planet (which amounts to becoming a public utility). Let’s explore planet-scale sharing more deeply. 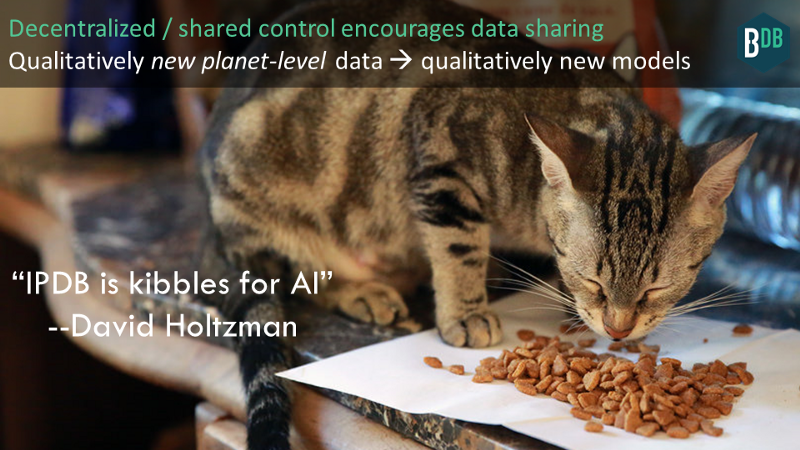 Planetary-level data sharing is potentially the most interesting level. Let’s drill further into this one. So, what does it look like when we have data sharing with a planet-scale shared database service like IPDB? We have a couple points of reference. The first point of reference is that there’s already a billion-dollar market (recently), for companies to curate and repackage public data, to make it more consumable. From simple APIs for the weather or network time, to financial data like stocks and currencies. Imagine if all this data was accessible through a single database in a similar structured fashion (even if it’s just a pass through of the API). Bloomberg x 1000. Without worrying that there was a single choke point controlled by a single entity. The second point of reference comes from the blockchain, in the concept of “oraclizing” outside data to make it consumable by a blockchain. But we can oraclize it all. Decentralized Bloomberg is just the start. Overall, we get a whole new scale for diversity of datasets and data feeds. Therefore, we have qualitatively new data. Planetary level structured data. From that, we can build qualitatively new models, that make relations which among inputs & outputs which weren’t connected before. With the models and from the models, we will get qualitatively new insights. I wish I could be more specific here, but at this point it’s so new that I can’t think of any examples. But, they will emerge! There’s also a bot angle. We’ve been assuming that the main consumers of blockchain APIs will be humans. But what if it’s machines? 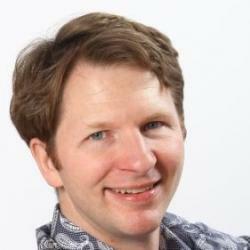 David Holtzman, creator of the modern DNS, said recently “IPDB is kibbles for AI”. Unpacking this, it’s because IPDB enables and encourages planet-level data sharing, and AI really loves to eat data. This application addresses the fact that if you train on garbage data, then you’ll get a garbage model. Same thing for testing data. Garbage in, garbage out. Garbage could come from malicious actors / Byzantine faults who may be tampering with the data. Think Volkswagen emissions scandal. Garbage may also come from non-malicious actors / crash faults, for example from defective IoT sensor, a data feed going down, or environmental radiation causing a bit flip (sans good error correction). How do you know that the X/y training data doesn’t have flaws? What about live usage, running the model against live input data? What about the model predictions (yhat)? In short: what’s the story of the data, to and from the model? Data wants reputation too. Provenance on sensor data (including IoT). Do you trust what your IoT sensor is telling you? Provenance on training input/output (X/y) data. Provenance on model building itself, if you like, via trusted executioninfrastructure, or TrueBit-style markets that double-check computation. At the very least, have evidence of model-building with the model-building convergence curve (e.g. nmse vs. epoch). Provenance on the models themselves. Provenance on testing input (X) data. Provenance on model simulation. Trusted execution, TrueBit etc. Provenance on testing output (yhat) data. We get provenance in both building the models, and applying them. The result is more trusted AI training data & models. And we can have chains of this. Models of models, just like in semiconductor circuit design. Models all the way down. Now, it all has provenance. Catch leaks in data supply chain (in the broadest sense), at all the levels. For example, you can tell if a sensor is lying. 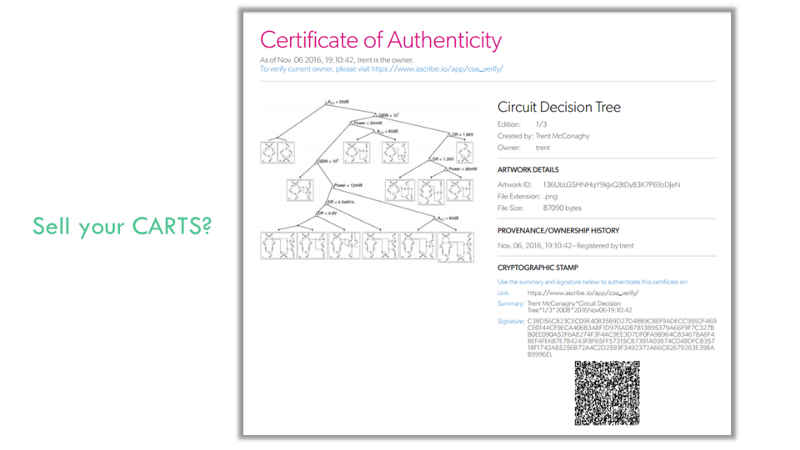 You know the story of the data and model, in a cryptographically verifiable fashion. You can catch leaks in the data supply chain. That way, if an error happens, we’ll have a much better idea of how and where. You can think of it as banking-style reconciliation, but for AI models. Data gets a reputation, because multiple eyes can check the same source, and even assert their own claims on how valid they believe the data to be. And, like data, models get reputations too. 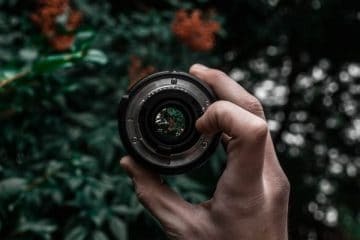 A specific challenge in the AI community is: where are the datasets? Traditionally, they have been scattered throughout the web, though there are some lists here and there pointing to main datasets. And of course many of the datasets are proprietary, precisely because they have value. The data moat, remember? But, what if we had a global database that made it easy to manage another dataset or data feed (free or otherwise)? 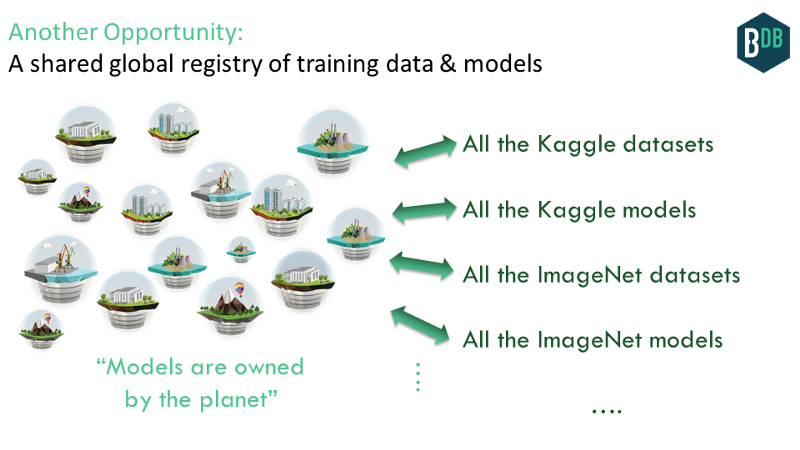 This could include the broad set of Kaggle datasets from its various ML competitions, the Stanford ImageNetdataset, and countless others. That’s exactly what IPDB could do. People could submit datasets, and use others’ data. The data itself would be in a decentralized file system like IPFS; and the meta-data (and pointer to the data itself) would be in IPDB. We’d get a global commons for AI datasets. This helps to realize the dream of the open data community. 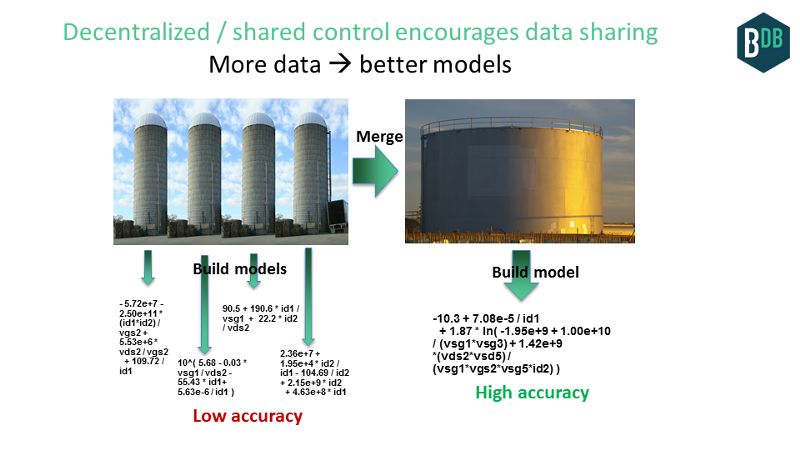 We don’t need to stop at the datasets; we can include the models built from those datasets too. It should be easy to grab and run others’ models, and submit your own. A global database can greatly facilitate this. We can get models that are owned by the planet. Let’s build on the application of “shared global registry” of training data and models. Data & models can be part of the public commons. But they can also be bought & sold! If you have created the data or model, you can claim copyright. This is whether or not you want do do anything commercially with it. If you have copyright of data or model, then you can license usage rights to others. For example, you can license your data to someone else to build their own model. Or, you could license your model for someone to include in their mobile application. Sub-licensing, sub-sub-licensing, etc is possible too. Of course, you can license data or models from others too. I think it’s pretty awesome that you can claim copyright of an AI model, and license it. Data is already recognized as a potentially huge market; models will follow suit. For your claim of copyright, it offers a tamper-resistant global public registry; where your claim is digitally / cryptographically signed by you. This registry can include data & models too. For your licensing transaction, it once again offers a tamper-resistant global public registry. This time, it’s not just digitally signed; rather, you cannot even transfer the rights unless you have the private key. The rights transfer occurs as a blockchain-style transfer of assets. Coala IP is a flexible, blockchain-friendly protocol for IP. IPDB (with BigchainDB) is a shared public blockchain database to store rights information & other metadata at Web scale. With this, we get data and models as IP assets. Once we have data and models as assets, we can start to make exchanges for those assets. An exchange could be centralized, like DatastreamX already does for data. But so far, they are really only able to use publicly-available data sources, since many businesses see more risk than reward from sharing. What about a decentralized data & model exchange? By decentralizing data sharing in an “exchange” context, new benefits arise. In being decentralized, no single entity controls the data storage infrastructure or the ledger of who-owns-what, which makes it easier for organizations to work together or share data, as described earlier in this essay. Think OpenBazaar, for Deep Nets. 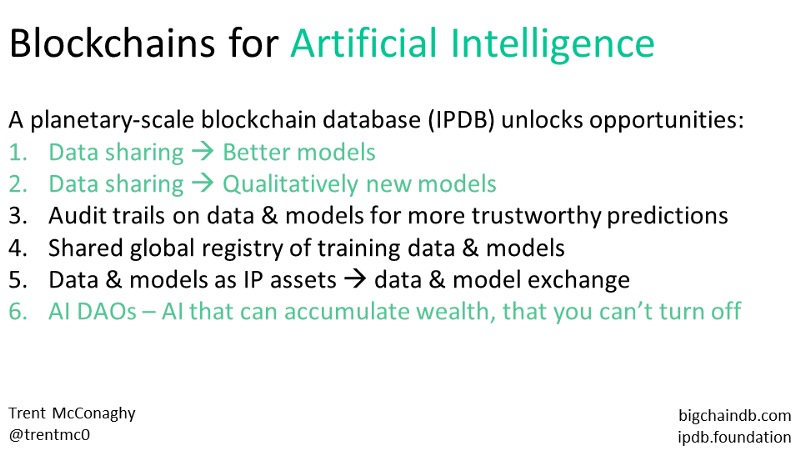 And of course we’ll have AI-based algorithmic trading on those exchanges: AI algorithms to buy AI models. The AI trading algorithms could even be buying algorithmic trading AI models, then updating themselves! This riffs on the previous application. When you sign on to use Facebook, you’re granting Facebook very specific rights about what they can and can’t do with any data that you enter into their system. It’s licenses on your personal data. It can be the same thing for AI data, and for AI models. When you create data that can be used for model-building, and when you create models themselves, you can pre-specify licenses that restricts how others use them upstream. This one’s a doozy. An AI DAO is AI that owns itself, that you can’t turn off. I’ve previously discussed AI DAOs in three posts (I, II, III); I’ll summarize the “how” below. 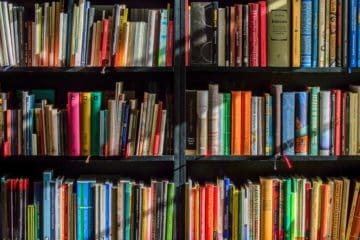 I encourage the interested reader to dive deeper. So far, we’ve talked about blockchains as decentralized databases. But we can decentralize processing too: basically, store state of a state machine. Have a bit of infrastructure around this to make it easier to do, and that’s the essence of “smart contracts” technologies like Ethereum. We’ve had decentralized processes before, in the form of computer viruses. No single entity owns or controls them, and you can’t turn them off. But they had limits — they basically try to break your computer, and that’s about all. But what if you could have richer interactions with the process, and the process itself could accumulate wealth on its own? That’s now possible via better APIs to the process such as smart contracts languages, and decentralized stores of value such as public blockchains. A Decentralized Autonomous Organization (DAO) is a process that manifests these characteristics. It’s code that can own stuff. Which brings us to AI. The AI sub-field called “Artificial General Intelligence” (AGI) is most relevant. AGI is about autonomous agents interacting in an environment. AGI can be modeled as a feedback control system. This is great news, because control systems have many great qualities. First, they have strong mathematical foundations going back to the 1950s (Wiener’s “Cybernetics”). They capture the interaction with the world (actuating and sensing), and adapting (updating state based on internal model and external sensors). Control systems are widely used. They govern how a simple thermostat adapts to a target temperature. They cancel noise in your expensive headphones. They’re at the heart of thousands of other devices from ovens to the brakes in your car. 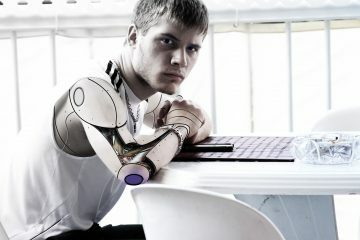 The AI community has recently embraced control systems more strongly. For example, they were key to AlphaGo. And, AGI agents themselves are control systems. 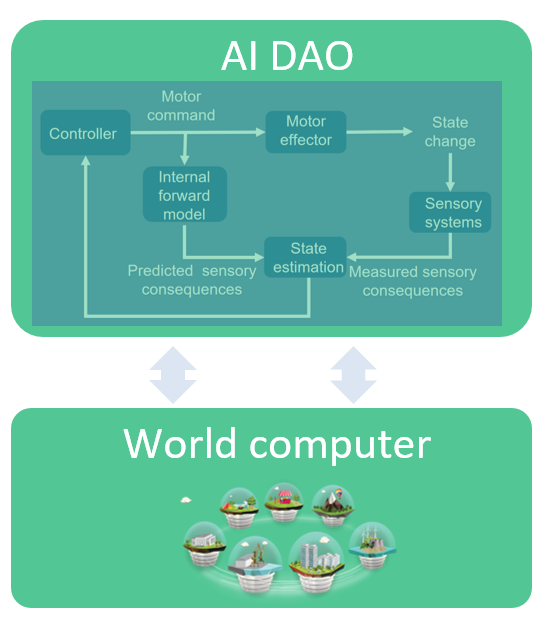 An AI DAO is an AGI-style control system running on a decentralized processing & storage substrate. Its feedback loop continues on its own, taking inputs, updating its state, actuating outputs, with the resources to do so continually. We can get an AI DAO by starting with an AI (an AGI agent), and making it decentralized. Or, we can start with a DAO and give it AI decision-making abilities. AI gets its missing link: resources. DAO gets its missing link: autonomous decision-making. Because of this, AI DAOs could be way bigger than AIs on their own, or DAOs on their own. The potential impact is multiplicative. An ArtDAO, which creates its own digital art and sells it. To generalize, it could do 3D designs, music, videos, and even entire films. Self-driving, self-owning cars. To generalize, any previous application of AI, but now the AI “owns itself”. We might have a future where humans own nothing, we’re just renting services from AI DAOs. Any DAO app, with AI infused. Any SaaS app, with more automation, and decentralized. This essay has described how blockchain technology can help AI, by drawing on my personal experiences in both AI and blockchain research. The combination is explosive! Blockchain technologies — especially planet-scale ones — can help realize some long-standing dreams of AI and data folks, and open up several opportunities. Blockchain-Enabled Convergence, whitepaper by Lawrence Lundy. How blockchain tech can help AI, VR, and other emerging technologies. Daemon and FreedomTM (sequel), novels by Daniel Suarez. How “dumb” software agents cause a chain reaction of events ending with a radical restructuring of society. Blockchains for Big Data, essay by Trent McConaghy. Big data powers much of modern AI. Blockchains can help big data, even without the AI angle. 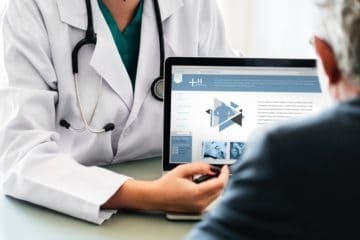 Google’s DeepMind Healthcare A.I. Will Use Blockchain, news article by Jamie Redman. Cool! This came out just as I was putting the finishing touches on this post. Thanks to the following reviewers / editors: Ali Soy, Adam Drake, Carly Sheridan, Dimitri de Jonghe, Gaston Besanson, Jamie Burke, Lawrence Lundy, Philipp Banhardt, Simon de la Rouviere, Troy McConaghy. If you have more feedback, please let me know and I’ll be happy to update the article. Trent McConaghy is an AI researcher and blockchain engineer. He is the founder & CTO of BigchainDB, IPDB, ascribe, and Solido. He started his career by doing AI research for national defense in the 1990s, while still an undergraduate, and went on to obtain a PhD from KU Leuven and receive an award for the #1 thesis worldwide in the field. He has done Machine Learning research for the Canadian Department of National Defense, and has written two books and 35 papers, and holds 20 patents on Machine Learning, circuits and creativity.